Modern furnace controls measure, visualize and save process-relevant data. 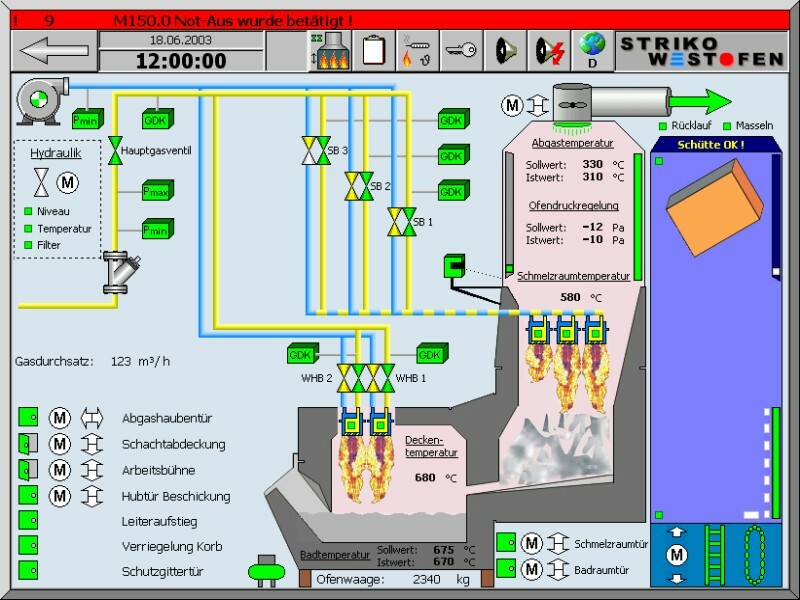 The knowledge of resource consumption of melting plants is indispensible for the furnace management. For this purpose, a furnace control provides for the data collection. Furnace operation and efficiency are measured as are metal and energy consumption. The company resource management has the task of evaluating process data. Therefore, the operating and melting line dispose of an efficient tool for measuring resource consumption and comparing it with data from the past. These data enable conclusions regarding furnace operation and state. Specific organizational or technical improvement measures can be taken which enable the best use of available resources and an increase in productivity (decrease of energy consumption, increase of metal yield). (Figure 1). Today, furnace controls are in general operated By menus. 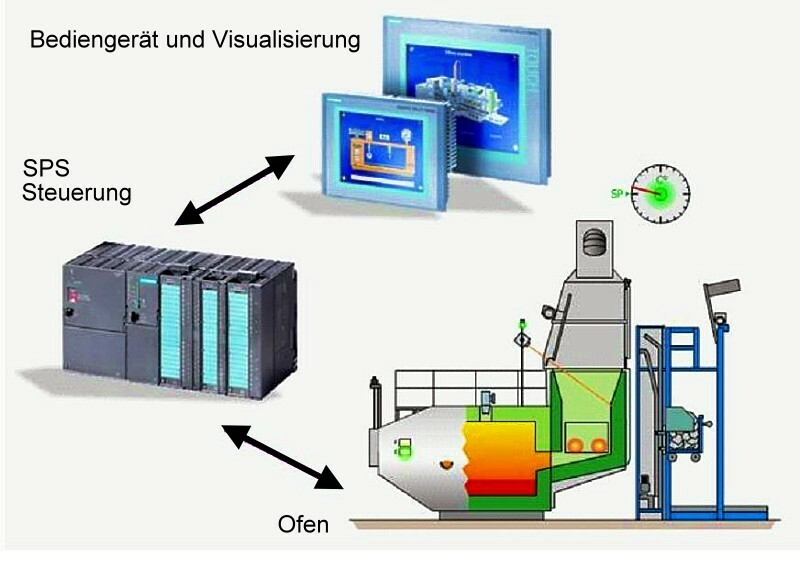 It displays current and important process data in a clear and self-explaining way in pictures on a color screen (Figure 2) where sub-menus show additional details. Furnace states as well as current shift protocols can be retrieved at any time by pressing the button (Figure 3). All data are recorded and saved on a removable medium. This way, data can be display on client computers. As an alternative, protocols can also be transferred by ethernet from the field to the control level. 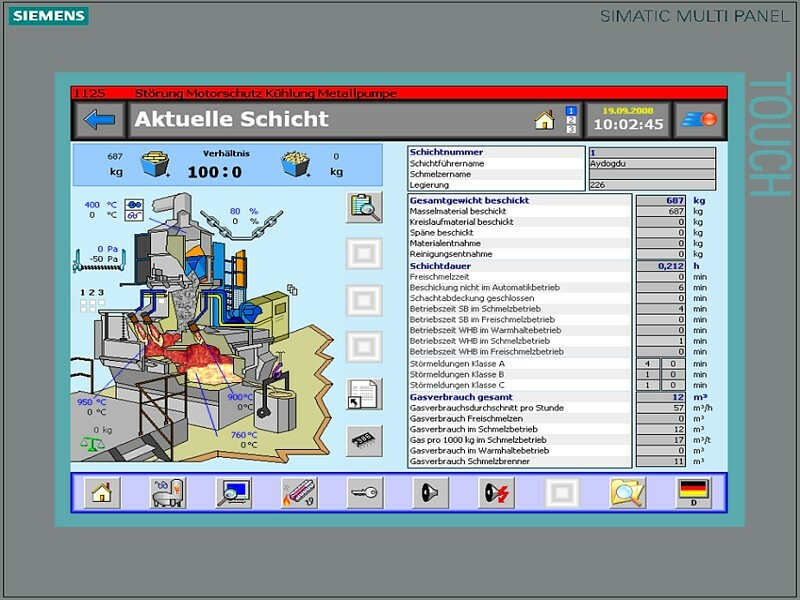 However, resource management does not require a data overload, but a clear and comparable process data display. For this reason, there is a data evaluation through a common spreadsheet program. The custom-programmed application is provided for by the furnace manufacturer. Minimum standards for furnace protocols comprise operation types and times, temperature progression and information archives which are crucial for quality assurance. If the furnace disposes of a weighing cell, feeding and extraction quantities including cleaning extraction can be listed. These data are completed by evaluating fuel consumption. Therefore, a complete protocol contains the average energy consumption, consumptions of different operating types and the specific energy consumption, i.e. the one referring to the melting performance. For ensuring a simple overview, a shift protocol is available as well as an evaluation on a day, week, month or year basis. Individual customer demands can be fulfilled.